If you were casting the role of dashing leading man rushing to the rescue of Austin’s theater scene, Roy Mullin could be the last person you’d consider. With his short-cropped gray hair, bookish glasses, and low-key voice that seems custom-built for NPR, the 61-year-old semi-retired financial adviser, and sometime actor appears more middle-aged Clark Kent than Superman. Yet, as any good actor knows, appearances can be deceiving. Mullin has a grand vision: He wants to build a sustainable, multi-use theater space to foster the downtown arts scene and support homegrown productions and artists. 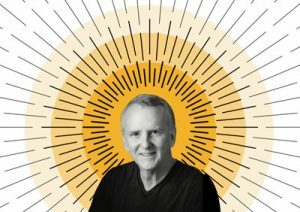 He just might possess the business savvy, connections, and persistent, show-must-go-on passion to make it happen. Nursing a hot cup of chai at a quiet East Side coffeehouse, Mullin reflects on the circuitous journey that brought him to his quest. As a UT student in the ’70s, Mullin was bitten by the acting bug, appearing in dozens of community theater productions before embarking upon the less ephemeral and more lucrative career of financial investment. Forty years and some considerable monetary success later, he had an epiphany. “I woke up one morning and found myself wanting to get back into the footlights,” he says. “I wanted my two kids to see their dad onstage at least once.” Four decades is a long time between curtain calls. After auditioning for a role at City Theater in 2015 and failing to get the part, Mullin tried another tactic: He offered to underwrite a production of the play A Man for All Seasons on the condition that he could audition for the lead role of Sir Thomas More. “It turns out that when the decimal point is in the right place, you pass the audition,” he says with a self-deprecating smile. The show was a popular success, with Mullin garnering critical kudos and recognition from Central Texas Excellence in Theater for one of the Top 5 Performances by an Actor for 2016. During the run, Mullin became increasingly aware of the epidemic of other theater companies in Austin losing their performance spaces due to high rents and skyrocketing property taxes. (See the feature “End of Scene” in our February 2017 issue.) Mullin resolved to do something about it. Discovering an available 4,400-squae-foot parcel of undeveloped land near Cesar Chavez Street and Interstate 35, Mullin promptly laid out $500,000 to secure it as the future home of a new theater, the first of several he envisions. The plan is to have the theater (to be called the Stage at Water Street) up and running in about three years, mounting seven major productions per season, along with art exhibitions, musical performances, and experimental theater. It’s an ambitious, utopian vision, more easily imagined than manifested. Mullin needs to raise an additional $2.5 million to complete construction on the theater, and he’s embarked upon a feverish one-man fundraising campaign. After making formal pitches to civic, financial, philanthropic, and investment groups, he admits he’s had few nibbles so far. But he’s not easily deterred.